Herbs and spices add flavor and aroma to food, but they also contain compounds with medicinal properties. This is one of the reasons why I consider the kitchen to be nature’s pharmacy. Herbs and spices are high in antioxidants and contain phytochemicals that provide many health benefits such as anti-inflammation, immune system boosters, digestive aids, liver detox support, anti-allergy, anti-high blood pressure, and many, many more. I like to think of them as my “food as medicine”. This summer I set out to plant my own herbs as a little experiment to see if I would be able to create my own medicinal teas, salves, syrups, and tinctures while I am indoors this fall and winter. Not sure what a salve or tincture is? No problem. This is just the beginning of many posts that will go into detail on herbal medicine. I wanted to first share my experience in planting and growing my herbs first. Because this summer was my first time gardening, I still have much more learning to do. For example, many “green thumbers” told me to not plant mint directly into my garden. I wanted to see for myself what would happen and they were right, it takes over! I chose to plant a spiral herb garden — thanks to being inspired by Pinterest! The logic behind a spiral herb garden is that plants that need the most sun are planted on the south and east sides, whereas plants that need less sun are planted on north and west sides. The spiral is also suppose to increase in elevation so that plants that like the sun are planted higher and can provide shade to plants that like less sun. We placed cardboard (without ink) at the base to kill the grass and block weeds from growing up. Then we dumped mushroom soil on top. Next we created a spiral with river rocks. We tried to create a change in elevation, but were not very successful in doing so. Tarragon is used often in French cooking. It’s health benefits range from helping improve digestion to assisting in eye function. Amethyst basil tastes similarly to green basil. Basil is wonderful for the immune system since it’s a natural anti-bacterial. It’s also a big cancer-fighter. Most of my herbs came from Suelke’s Roadstand located Old Bethlehem Pike in Sellersville. It’s close by and I’d rather shop local if I can. Lemongrass has a refreshing citrus smell. It’s leaves can be dried and used to make tea. It’s stalk can be chopped up and added to create Thai and Asian style cuisine. The citrus smell comes from a chemical component, citral, which has strong anti-microbial and anti-fungal properties. This summer I also discovered a book that I LOVE for anyone getting into growing herbs and using them to make your own tea and natural medicines. 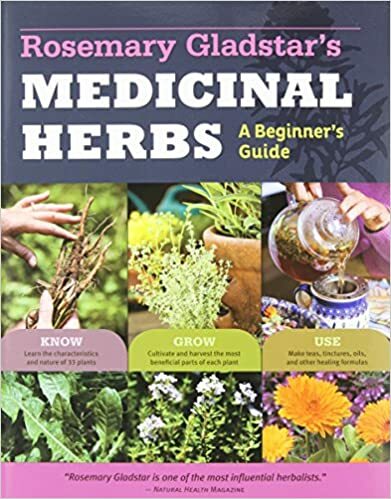 I highly recommend Medicinal Herbs: A Beginner’s Guide by Rosemary Gladstar. Click on picture to see the names of everything planted. As you can see, the lemongrass got HUGE! Unfortunately it shaded some plants that love the sun. Today I finished my harvest. I completely cut the lemongrass down and clipped some thyme, oregano, chocolate mint, spearmint, parsley, and rosemary for drying. Hoping my thumb is greener by next year! My babe-dog Winston helping his Mommy out. This summer I found my new calling – gardening! I can’t wait for next Spring and learning from some of my mistakes from my first go round. Please join me on my herbal adventure and come back soon! I will be sharing what happened when I took my herbs indoors and what kind of health concoctions I will later create!